While the long-awaited renewable energy feed-in tariff (Refit) aimed at stimulating investment in the sector remains in limbo, an environmental project has secured funding from the German government to set up renewable energy demonstration sites at 10 public areas in South Africa. Sites include the Johannesburg and Pretoria Zoos and the Two Oceans Aquarium in Cape Town, as well as NGOs and institutions in Limpopo and KwaZulu Natal. Once completed by July this year, the initiative, will save approximately 200 tonnes of CO2 emission per year. Run by environmental initiative Project 90×2030, who received R5 million in funding from the German Ministry of Cooperation (BMZ) in October last year, the project also aims to demystify renewable energy generation for the public and show how renewable energy can provide sufficient, reliable and cheap energy that will not impact negatively on professional activities. 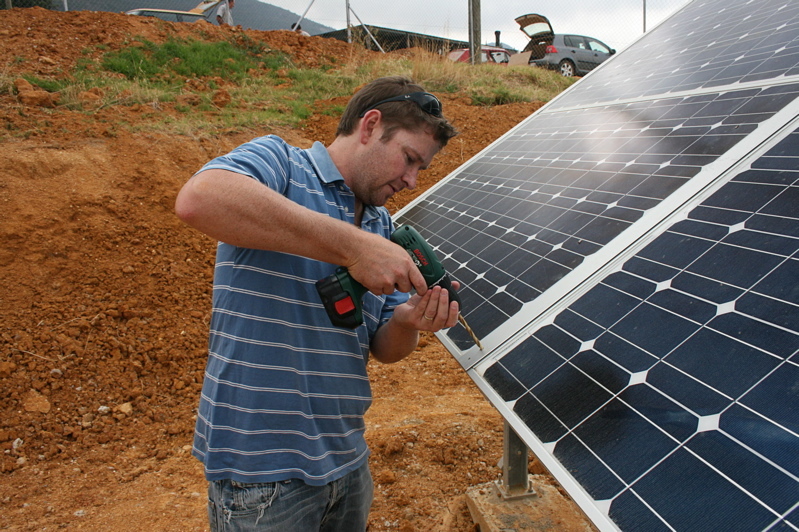 One site generating 8kW of electricity from eight solar photovoltaic (PV) panels, is already running at a model farm run by the Goedgedacht Trust near Malmesbury in the Western Cape, while work has begun, or is about to begin, on the remaining sites. The means of renewable energy generation differs at each site, depending on the energy requirements and availability of raw material. At a mission station in the KwaZulu Natal Underberg, the hydraulic power running a 200-year-old mill was being harvested to run a turbine to generate 25kW of electricity to power the mission station on which the mill is situated. Means of generating renewable energy at the various sites include solar water heaters, biogas, wind turbines and photovoltaic panels. Where possible, water conservation measures such as waterless toilets are also being put in place. At the Johannesburg Zoo, for instance, consultant Gary Fahy from Grey Green Sustainable Energy Engineering said they were planning to install biogas digestors to provide gas for cooking in the restaurant, solar photovoltaic (PV) panels to generate 4kW of electricity and were looking at the feasibility of using biowaste to provide fuel for the zoo’s vehicles. The generation of 4kW of electricity, on an average of six hours of sunlight per day, equalled 24kilowatt hours (kWh), said Fahey. The average household runs on about 10kWh of energy. Additionally, animal enclosures that required electric fencing were to be powered by solar energy. Wouter du Plooy, who worked as curator of grounds and fleet management at the zoo until December last year, said the generation of renewable energy would lessen the zoo’s electricity bill but would not have a significant impact, as there were other a number of energy intensive facilities there. It would take “a long time” before the entire zoo was run off renewable energy, he said. However, for some of the small rural sites, it will be the first time they have had access to electricity. At the zoo, and similarly at the Two Oceans Aquarium, the renewable energy site would be part of the education centre. Visitors “could think about installing such systems in their own home,” said du Plooy. It would show visitors that generating renewable energy at a domestic scale was not only feasible, but relatively simple. The problem for homeowners was not the complexity of the system but the fact that setting them up was capital intensive, said Fahy. He said this was why the financial sector needed “to come on board” and lend the necessary capital to individuals and small businesses so they could invest in renewable energy systems, with agreements that the money saved on the electricity bill would be used to pay off the loan. Project 90×2030 director Brenda Martin said institutions selected as partners for the demonstration site were committed to reducing their carbon footprint and educating their staff and visitors on climate change and the need to embrace renewable energy and energy efficiency. Projects and initiatives such as this are very encouraging and will hopefully only be the start of foreign and governmental investment in renewable energy in South Africa. All that we can hope for is a rapid uptake of renewable energy technology such as solar in order to alleviate our fossil fuel dependancy and filter cost savings associated with green energy to the end user.